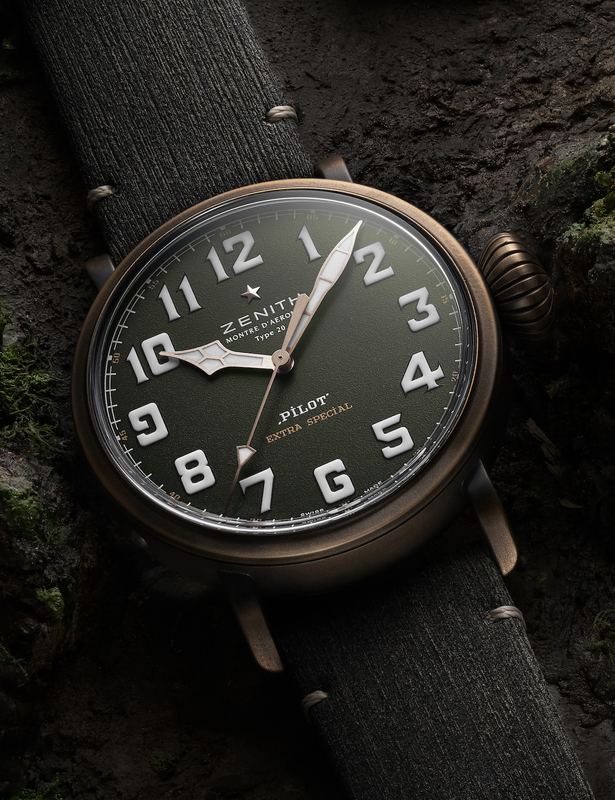 The case, in bronze, measures 45mm x 14.2mm. 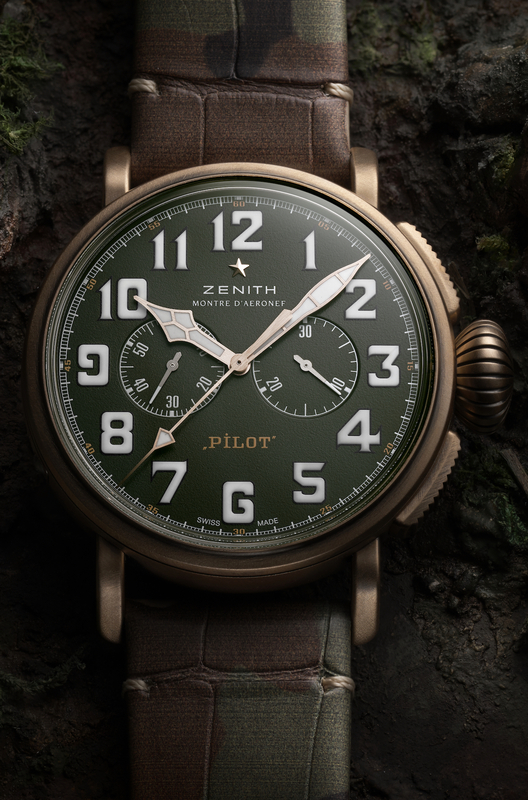 It has a domed AR-cocated sapphire crystal, a titanium caseback engraved with the Zenith Flying instruments logo, and it is water resistant to 100 meters. Movement is the Swiss automatic Zenith in-house caliber El Primero 4069 with 35 jewels, 36,000 vph and a power reserve of 50 hours. Rotor with Côtes de Genève decoration. Functions are: hours and minutes in the center, small seconds at 9 o'clock. Chronograph: central chronograph hand and 30-minute counter at 3 o'clock. 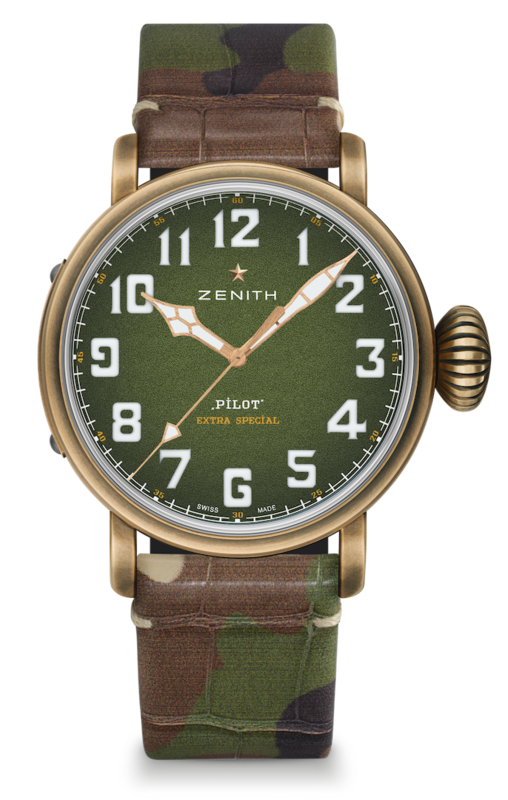 It has a grained Khaki green dial with Arabic numerals with SuperLuminova. Gold-plated, faceted and coated with white SuperLuminova hands. 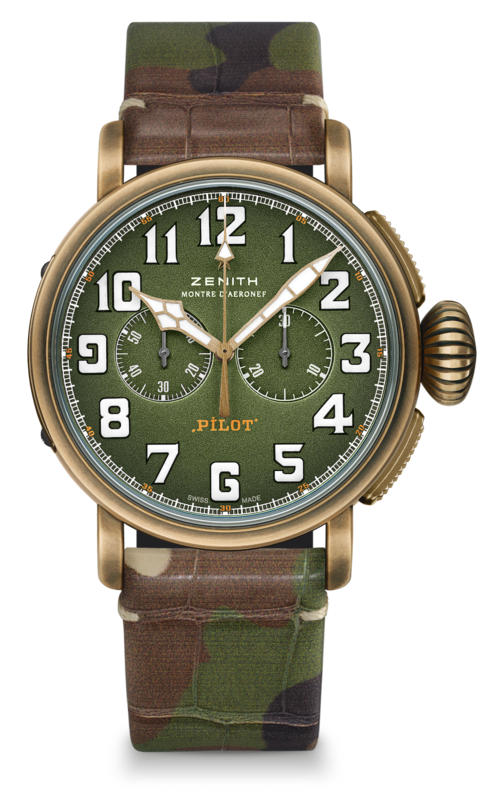 It comes on a camouflage alligator leather strap with protective rubber lining. A second strap is included (Khaki matrix calfskin leather with protective rubber lining). Titanium pin buckle. Movement is the Swiss automatic Zenith in-house caliber Elite 679 with 27 jewels, 28,800 vph and a power reserve of 50 hours. Rotor with Côtes de Genève decoration. Functions are: hours and minutes in the center. Central seconds hand. Previous Topic: Baselworld 2019 - Zenith Defy Inventor with 129,600 VPH!